We always jump with two parachutes, a main parachute and a reserve parachute – both of which are exceptionally reliable and extremely well designed. Each parachute is designed to work independently of the other and both are capable of bringing both yourself and your Tandem Skydiving Instructor back to earth safely. The parachute systems also incorporate all sorts of other safety devices such as;- an Automatic Activation Device (AAD) which will automatically deploy the reserve parachute if you’re still in freefall at 2,000 feet, a back-up drogue parachute release system, a reserve lanyard system, a reserve parachute “free-bag” deployment system – and the list goes on. 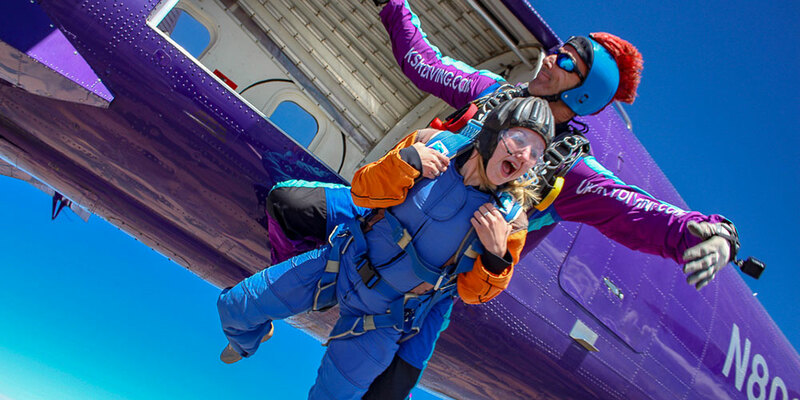 In short, the equipment we use is the very best in the industry and incorporates all the latest safety features designed to keep both yourself and your Tandem Skydiving Instructor safe. You won’t find better equipment anywhere.